Leaders of nonprofits know hard work, they know toil and they know disappointment. Many of them face these on a daily basis as they struggle with very little resources to accomplish daunting tasks to support their community. 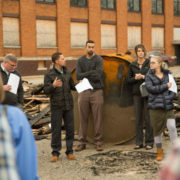 Justin Beene, director of the Grand Rapids Center for Community Transformation, is no stranger to the nonprofit struggle, but was hit even harder a couple of weeks ago when his organization’s brain child, the Rising Grinds Café, burned to the ground. A coffee shop that was two and a half years in the making and set to open at 1530 Madison Ave. in May of 2017, Rising Grinds was slated to be a place that would empower young adults with employment and training opportunities. Literally digging through the rubble in hopes of rebuilding, Beene and others behind the shop are still optimistic that the project is destined to get back on track and change lives in the Madison Square neighborhood by hiring disenfranchised youth from the neighborhood and other community members. “We’re just trying to pick up the pieces,” Beene says following the fire at the café’s construction site on Nov. 19. With $15,000 invested in design and architectural drawings and another $10,000 of purchased plumbing, lighting, wood and windows, not to mention labor costs, Beene and his staff have a long road ahead of them. “A partnership between businesses and nonprofit organizations to create opportunities for transformation through meaningful relationships, work, education, and community revitalization,” the GR Center for Community Transformation is a collaborative entity created by Bethany Christian Services, Tabernacle Community Church and Double O Supply & Craftsmen Inc. Focusing heavily on GR’s disempowered youth, Beene developed the café as a unique social enterprise in which young adult employees could thrive. “We want this business to impact the neighborhood and the people that were employed there,” he says. We Will Rise Again – Rising Grinds Cafe from Dakota Riehl on Vimeo. Instead of merely hiring anyone interested in a part-time position at the café, Beene would focus his recruitment efforts on individuals in foster care, as well as immigrants and refugees who are not generally afforded the social networking opportunities to obtain their first jobs. In addition to decent wages, employment at the café would also offer a slew of benefits, including a matched social worker to assist with housing and other issues, enrollment in the center’s GED program and training in customer service and construction. 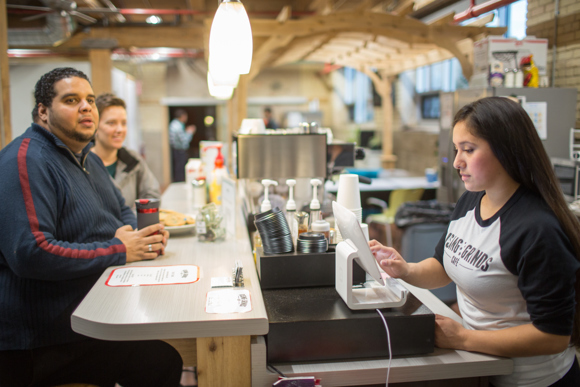 “The coffee shop itself is a social enterprise,” says Beene, whose aim is a self-sustaining business for the caféwithin three years of opening. All of this is designed to engage the youth working there in all of the business aspects of the café. The bottom line: empowerment for the employees. “It doesn’t matter how you get to us; we will try to find something for you,” says Beene. Already employing two young adults that graduated from Bethany Christian’s Youth Build program (a seven-month program that provides a pre-apprentice instruction certificate and their GED, among other things) work in the coffee shop’s Madison Avenue incubation space, Beene involved them from the very beginning in the business planning and naming of the café. “It’s a different work environment. We have kind of this family atmosphere that we’ve created,” he says. Area youth run the coffee shop, temporarily in the CCT’s offices. Utilizing a “little unique building” in the Madison Square neighborhood just 30 yards from the Center for Community Transformation’s incubation building and workspace, Beene and his staff decided, “let’s make this a coffee shop.” The new café was in the process of being renovated by youth from the YouthBuild program, an intensive program for low-income young adults as they completed their GED while simultaneously learning construction skills by building affordable housing or other community-based projects. Engaging his two youth staff to manage the development for the space, Beene was already knee-deep in renovations and had announced an opening date of May 2017 when disaster struck. On the morning of Nov. 19, Beene received a text that read, “The coffee shop is on fire.” Devastated, “I rushed here and watched it burn,” he says. Though no one was hurt in the early morning fire, the building was utterly destroyed, and the temperature of the blaze ran so high that all of the windows on the Center for Community Transformation’s main building cracked from the heat. In total, the space lost more than $50,000 worth of equipment and donated materials in the blaze. “It looks like a war zone,” says Beene. “The site is unsalvageable, and the Grand Rapids Fire Department is still investigating the cause of the fire,” Bethany Christian Services writes in a press release. Seeking above all to recommit the community’s support for this unique and ambitious project, the center hosted a moment of blessing on the afternoon of Nov. 30. With more than 50 people in attendance, including three city commissioners and the president of the Michigan chapter of the NAACP, Beene felt the community’s support for the would-be café. “It was really encouraging to hear how people were feeling,” he says. 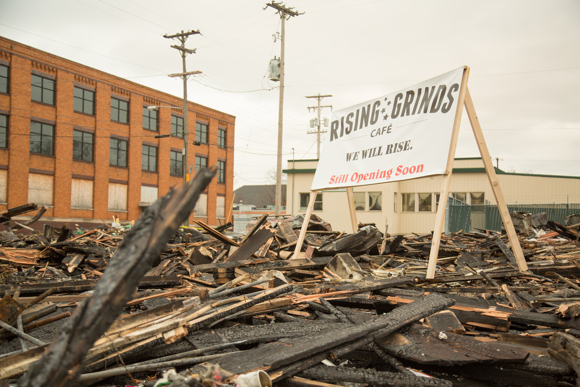 If you’re interested in learning how you can help support Rising Grinds Café‘s rebuilding efforts, please visit their fundraising page here. You can also visit the Center for Community Transformation at 1530 Madison Ave. and enjoy a cup of coffee at the Rising Grinds incubation site.